Ritu Raj Tapes Pvt. Ltd. is a Manufacturers of Packaging Materials, BOPP Packing Tape, Self Adhesive Tapes Industrial Tapes, Shrink Wrapping, Flexible laminates, Blister packaging, Packaging Tapes, Kraft Paper Tape for Packaging & Much More. We can accept minimum order quantities (M.O.Q.) corresponding to 10 cartons (say roughly 200 gross, or 30 000 units). We are the prominent manufacturer and supplier of the high quality assortment of Hot Melt Double Sided Tissue Tape for Stationary. Offered tape is processed using supreme class tissue and other related basic material with the help of latest technology in compliance with the set quality standards. 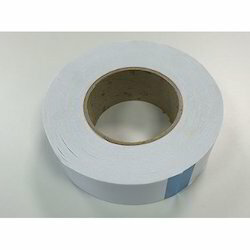 Widely used in various industries for packaging purposes, this tape is available in various specifications as per the requirements of clients at highly competitive prices. 9R is a special tape which consists of non woven tissues and coated with strong Hotmelt adhesive on both side. It bonds, firmly on to paper industries, etc. 9R is a special tape which consists of non woven tissue and coated with strong solvent adhesive on both the sides. It bonds firmly on to leather, clothes, woods, plastics and two similar of dissimilar materials.